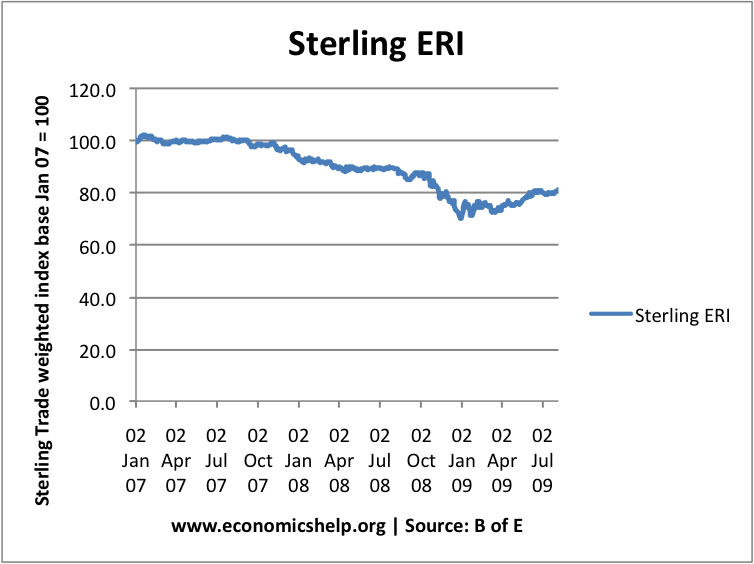 Despite a 10% appreciation in the first half of 2009, at the end of June 2009 the £Exchange Rate Index was around 20% lower than in August 2007. Since July, the Pound has weakened again. Bank of England suggesting low Pound is beneficial and they will not increase interest rates to protect pound. Persistent Current account deficit. Governor of Bank of England has suggested Pound needs to fall to help rebalance trade. Quantitative easing which is increasing Money supply and potential inflation. Inflation would reduce the value of Sterling. Large Government Debt, partly being financed by Bank of England buying securities from created money. This makes markets nervous over future of Sterling.